Q: According to reports, US Secretary of State Rex Tillerson spoke with State Councilor Yang Jiechi and his Russian and French counterparts about the Iranian nuclear issue on October 12. Can you give us more details of the telephone conversation between State Councilor Yang Jiechi and Secretary of State Rex Tillerson? A: On October 12, State Councilor Yang Jiechi had a telephone conversation with US Secretary of State Rex Tillerson at request. The two sides exchanged views on the China-US relations and both said various preparatory works should be continued so as to ensure important and positive outcomes of President Donald Trump's state visit to China upon President Xi Jinping's invitation in November. The two sides also exchanged views on the Iranian nuclear issue. Q: According to reports, China and the Republic of Korea renewed the currency swap agreement today. Will this play a positive role in improving the relations between the two countries? A: I would like to refer you to the Chinese competent authority for the issue of the currency swap agreement. Q: It is said that US President Donald Trump is going to announce that he will decertify the 2015 Joint Comprehensive Plan of Action (JCPOA) , but this move does not mean that the US will withdraw from the deal. What is your comment on that? A: China's position on the Iranian nuclear issue has been consistent. The JCPOA has played a key role in upholding international nuclear non-proliferation regime and the peace and stability of the Middle East region. We hope that all relevant parties will continue to uphold and implement the JCPOA. Q: According to reports, the Palestinian National Liberation Movement (Fatah) and the Islamic Resistance Movement (Hamas) signed a reconciliation agreement in Cairo on October 12. Hamas will hand over the control of the Gaza Strip to the Palestinian National Authority before December 1. What is your comment on that? 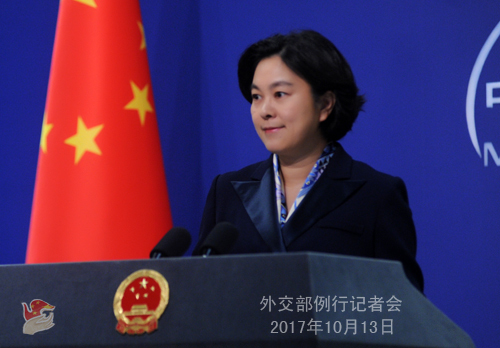 A: The Chinese side maintains that the positive progress of Palestine's internal reconciliation is conducive to promoting its internal solidarity, the resumption of peace talks between Palestine and Israel and the final realization of Palestine's independence and the establishment of the Palestinian state as well as the peaceful coexistence of Palestine and Israel. 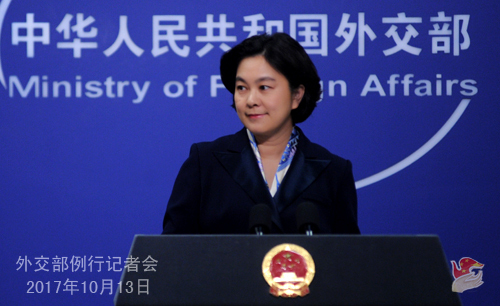 China appreciates Egypt's effort to promote Palestine's internal reconciliation. Q: The US and Israel have announced to withdraw from the United Nations Educational, Scientific and Cultural Organization (UNESCO). Does China have a comment on that? A: The Chinese side has noted the relevant remarks. The purpose of UNESCO is to advance international cooperation in the fields of education, science and culture, promote mutual understanding and integration between civilizations, uphold world peace and realize common development. The Chinese side hopes that all countries can make contributions in this regard. We will continue actively participating in and supporting the work of UNESCO and are willing to conduct cooperation with other countries in this respect. Q: Reports claim that China has withdrew its candidate for the post of the Director-General of UNESCO. Can you confirm it? A: The Chinese side has always valued the status and role of UNESCO and hopes to make greater contributions to UNESCO and the cooperation in the relevant fields. The Chinese side supports this organization in electing a director-general that meets its requirements and the expectation of the member states in accordance with the relevant regulations. The Chinese side expects that the newly elected director-general will lead UNESCO into greater contributions to upholding world peace and promoting sustainable development. Q: According to reports, US House Foreign Affairs Committee passed the Taiwan Travel Act on October 12, which calls for the complete lifting of restrictions on high-level visits between the US and Taiwan. How do you comment on that? A: We have noted the relevant reports. I have to stress once again that the relevant bill has severely violated the one-China policy and the principles of the three China-US joint communiques and constituted interference in China's internal affairs. We are firmly opposed to this. The Chinese side urges the US side to comply with the one-China policy and the principles of the three China-US joint communiques and cautiously handle the Taiwan question, not to engage in any official exchange and contact with Taiwan or send any wrong message to the "Taiwan independence" separatists least the larger picture of the China-US relations should be disrupted and undermined. Q: According to reports, Suzuki Eiji of the Japan-China Youth Exchange Association under arrest was given the first-instance judgment at Beijing's Intermediate People's Court in August. What is he charged with? A: I have no information in this regard. But I would like to stress that the Chinese side will continue handling the relevant case in accordance with law and safeguarding the legal rights and interests of the person concerned. Q: It is reported that on October 11, Spanish Prime Minister Mariano Rajoy sent a written order to the president of the Catalan autonomous region, which formally requested the government of the Catalan autonomous region to confirm whether it has declared the independence of Catalonia by October 16 at 8:00 GMT. If the independence is confirmed, the Spanish government will give the Catalan government an additional three days to rectify it. Failing this, all necessary measures will be taken under Article 155 of the Spanish constitution. Do you have any comment on that? A: I have stated the position of the Chinese side at request over the past two days. The Chinese government understands and supports the effort of the Spanish government to uphold national unity, ethnic solidarity and territorial integrity. We hope and believe the Spanish government and people are capable of finding a proper solution under the framework of law and order to uphold national solidarity and stability.